I stumbled upon this quite by fortune this week -- I don't know if I've been watching less tv or what, but I haven't seen anything about AMC's new show The Killing before this week. One of the blogs I read pretty regularly is Eurocrime, a blog devoted to British and European crime fiction. And since I'm a big fan of British and European crime, Karen's blog is a fantastic way to get a heads up on new releases in the genre. (Consequently, I'm also a big BBC America fan so that usually means waiting to see if some of the highlights from her blog make it to air over here!). This post about a BBC's airing of the French series Spiral really caught my eye. Unfortunately, it's not out on region 1 (US) dvd, but I'll be keeping my eye out. Anywho, she mentioned the Scandinavian show The Killing and through the magic connect the dots that's possibly through the internet, I found out that AMC has remade the show and it will begin airing this Sunday. I'd still like to get my grubby little hands on a dvd of the Scandinavian series (and Spiral as well) but I'll just have to wait and see if that becomes possible in the future. And unfortunately, though it would seem pretty likely, it doesn't look like either series has sprung forth from the concept of a book. Oh, thank goodness it's finally the weekend! I'm keeping it short and sweet today. I've just jumped into today's pre-pub title and I'm anxious to get back to it. Deadworld has blurbs from Lilith Saintcrow, Mark Henry, and Kat Richardson, all authors I've read and enjoyed, so I was super jazzed to get my hands on Duncan's book early. I'll keep you posted and have an official review for BB soon. So far, I can say that the tiny bit I've been able to read between cleaning for dinner company and taking the dog to the vet is super intriguing. So mark your calendars, new urban fantasy (or, as Duncan refers to it, paranormal thriller) series debut Deadworld is officially hitting shelves on April 5, and number 2 in the series is set for release in October. Carrie Ryan's latest is out on shelves now and if you've not been reading this post outbreak, apocalyptic teen fantastic-ness, well, you're missing out. Really missing out. Annah has managed to make it this far. Ever since Elias joined the Recruiters, she's been alone in the Dark City, fending for herself and waiting for his return. But it's been three years now and Annah no longer believes Elias will be returning for her. As she readies herself to finally leave, the horde arrives in the Dark City. At the same time, Annah sees the unimaginable: her sister, Abigail, entering the Dark City. Now Annah must work together with Catcher, a friend of the sister who can't remember her, to save Abigail (Gabry) while protecting themselves from the horde. Ryan's world-building alone is enough to set this series apart, but I love her characters! And while The Dead Tossed Waves is Gabry's tale, we finally meet Annah in The Dark and Hollow Places. Dark and bleak, but there's hope... Zombie-pocalypse is still going strong in my reading list! I don't know if this is it for the series. It didn't feel that way, but I'm not entirely certain if it's the last. Maybe it is or maybe Ryan will bring us back there someday. No word yet (that I can find) on what she has up her sleeve next, but I'm sure it will be amazing! Mike was out snowboarding this weekend so it was just us girls (yes, I'm that nerdy -- girls meaning me, the cats, and the dog). I loaded up the movie queue with chick flicks and headed out to see Lincoln Lawyer on my own (more about that another time) and got some reading in, too. And what did I devote my lovely, quiet (well, maybe not so quiet considering my neighbors) weekend to reading? 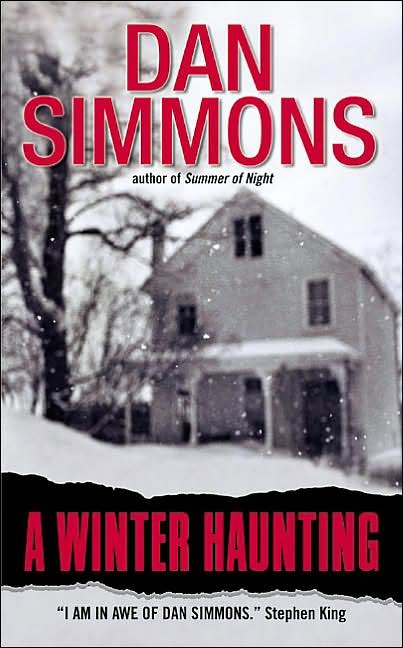 Dan Simmons's A Winter Haunting, for one! I couldn't resist. I just read Summer of Night and I had to return to Elm Haven again. Plus, I love Simmons and the book got rave reviews when it was released in 2002. Though this book is a sequel in some sense to Summer of Night, it's not exactly. Dale Stewart returns, as do a few other characters. It takes place in Elm Haven, on Duane McBride's old farm, and there are some references to the events of the summer of 1960, but Dale actually doesn't remember what happened so if you haven't read Summer, you can still read Winter all on its own. Though I'd suggest making time for them both 'cause Simmons is amazing! After an attempted suicide, Dale Stewart leaves his teaching position, taking a nine month sabbatical to write his new novel and figure some things out. He's chosen to return to Elm Haven, renting the old farmhouse his friend Duane McBride used to live in. Rumor has it the house is haunted and Duane's aunt kept the place almost exactly as it was back in 1960, the only time Dale ever stepped foot in the home. The second floor has been closed off for four decades and even Duane's and his father's things are still in their old places. The longer Dale stays in the house, the more strange things he begins to experience. But is Dale going mad or is the house truly inhabited by something inhuman? Oooh, the atmosphere and the storytelling! And I so loved returning to Elm Haven. I know, it's kind of a creepy little dying town, especially considering the events of both books, but I love the idea of the two stories being tied together by a common place and characters even if they do stand alone on their own. Definitely highly recommended, readers. Horror and psychological suspense fans will love it! Gabrielle Hamilton, chef and owner of New York's Prune restaurant, has led quite an amazing life thus far. Though becoming a chef never seemed to be at the forefront of her goals, it's something she came back to over and over again. She has a masters in fiction writing and her work has appeared in the likes of Food & Wine, Bon Apetit, and The New York Times (amongst others), but this is the first time she's set her pen to writing out her story, the "Inadvertent Education of a Reluctant Chef." Her talent for writing and her love of food come together in this latest food memoir, one that's earned the high praise of Anthony Bourdain himself (who's been a fan of Hamilton's restaurant for quite some time, apparently). I do love food memoirs. I don't know if I'm a foodie or an eater (Hamilton differentiates between the two). I don't think I have a snobbery for food and I'm not a food adventurist per se, I just want to be exposed to and to have the chance to try as many things as I can (within reason). But it's an extra plus to read about the adventures occurring in chef's and cook's kitchens around the world. From celebrities of the food realm like Bourdain to Hamilton, a celebrity in her own right though recognized more for her food than her tv appearances, to bloggers with small city kitchens exploring their local markets, I find it all fascinating. It's kind of like standing in their kitchens and watching them cook -- something I'll never be able to actually do in person. One day, maybe if I'm lucky, I'll get to eat at Prune myself, but until then, Blood, Bones and Butter satisfied an appetite that had been fed by numerous reviews I'd been reading in anticipation of the release of Hamilton's book. Blood, Bones and Butter: The Inadvertent Education of a Reluctant Chef is out now. You can read more about Hamilton, Prune, and the book via the links above (top of the page). And I came across this interview yesterday. Actually, that title is a misnomer. My weekend wasn't missing, I was. I know -- I missed my pre-pub post (and had a great title, too -- it'll go up next Sat) and the new release post. So what was I doing? Reading and playing Dead Space 2, and seeing some movies and otherwise taking some time off from the computer. Anywho. I have a way back when review for you today. I mentioned I'd been away for work recently and packed books for the trip -- as usual, too many to possibly get to. I found that I only actually made it through a book and a half from my TBR stack, Cold Granite and part of Dan Simmons's Summer of Night. Took me a few days beyond my return to finish, but I have to say that Summer of Night was fantastic! Now, some of you are already Simmons fans. He's a jack of all trades writing everything from science fiction and horror to mystery and literary with every genre twist there is so far. I've got an entire collection going in my TBR stack. I've read The Terror (British Fantasy Award nom, 2008), Song of Kali (World Fantasy Award winner, 1986), and now Summer of Night (British Fantasy Award winner 1992) and loved them all. Next weekend, in spite of my growing review list, I think I may tackle Summer's sequel, A Winter Haunting. It would be appropriate to save it for mid summer, but there's no way I can wait that long! In Summer of Night, the ominous Old Central School is on its last leg. After this school term is finished, it will be closed for good. But when a student goes missing on the last day of school, a group of friends decides that they will unravel the mystery. The boy's sister insists that he never left the school. What's worse, she's convinced that some of the grownups in town know more than they're saying. For Duane, Dale, Mike, Jim, Kevin, and Laurence, their little adventure will turn terrifying in ways they could never have imagined! It's so good! I mean, I'd heard how good it was and I expected it to be great based on my experience with Simmons so far, but it still blew me away. I can't even find a cover image that matches my old copy, but it looks like there's a nice reprint trade copy coming out in July (nice! I'll have to replace my beat up Carrion Comfort in the same purchase!). I think I like the old cover treatment (on both) better, but they're falling apart. I'm a HUGE fan of Lilith Saintcrow. HUGE! And when Orbit launched back in 2007 and re-released Working for the Devil, I snatched it up as soon as I could. I absolutely fell in love with the series: the characters, the setting, the plots... agh! And then it ended. And I was sad. But then Saintcrow came along with her Jill Kismet series and her YA series, and I was happy again. Of course, Dante and Japh will always hold a special place in my heart for being my introduction to Saintcrow and now Orbit is releasing the whole series, in its five book entirety, in one big honking volume. And if you haven't read the series yet, this is the perfect time to head out and pick up the $20 doorstopper and get started! Trust me, it'll do you good. It's a dark series set in a near future. Dante is a necromancer, Japh is a demon, the devil's involved. There's mystery, science fiction, fantasy, and even a little romance. You need to read it! I've linked to my posts on the first in each of Saintcrow's series, but reviewed all five Dante Valentine books for Bookbitch.com. Those reviews can be found in the archives on her site -- but be warned later titles probably have spoilers in the reviews if you haven't read the books in order. I had to go to El Paso last week for work, which of course meant picking airplane/hotel reads for the trip. Unfortunately, although I packed six books from my TBR stack, I only finished one. Unfortunate for my TBR stack, that is. Fortunate that I stayed busy. What book did I manage to get through? 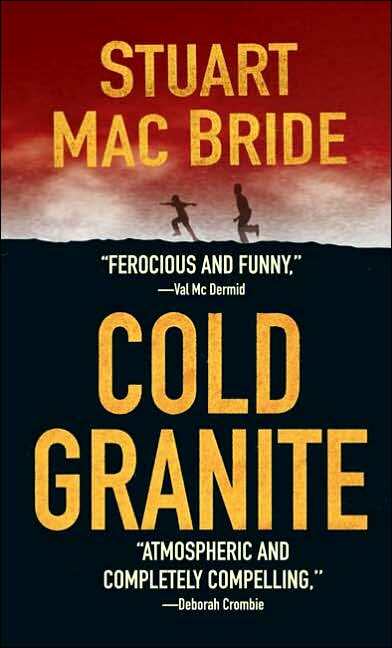 Stuart MacBride's Cold Granite, the first in the Logan McRae series. After surviving a stabbing, Detective Sergeant Logan McRae has finally returned to work. But it's not going to be an easy first few days back. The discovery of a little boy's body and the disappearance of a second child are just the beginning of a difficult case for the Aberdeen investigators. Dead end leads and a lack of solid clues are worsened by the public's outrage and more dead bodies. MacBride's debut is a dark and dense read. I'd actually recommend giving yourself a longer stretch of time to devote to this one -- the side effects of Dramamine and the constant distractions of the airport really cut into my reading of this one. I think that's why it took me longer to get through than it normally would. I've seen MacBride compared to Ian Rankin and some of the other UK authors out now. I've not yet had the pleasure of reading Rankin and I'm only one book into John Connolly's series so far, but I think it's a safe comparison based on what I know about these authors. You can see here (and this is showing you just how bad the TBR stack is) that I actually picked this one up based on a bookseller recommendation in my continuing quest to find more Mo Hayder like books. Here's another absolute must have in the urban fantasy/paranormal mystery genre. Ben Aaronovitch, a former Doctor Who writer (so you know he had to be on my must read list with just that under his belt) bursts onto the UF scene with this first in the new Peter Grant series, Midnight Riot. Sure it could have been a right place, right time situation, but Peter Grant's fortuitous meeting with a witness at a recent murder scene propels him from the ranks of Probationary Constable on the path to the Case Progression Unit (a paperwork division of the Metropolitan Police Service) to a position as protege to Detective Chief Inspector Thomas Nightingale, the man in charge of investigating cases involving magic. See Peter's witness is a not so recently departed haunt who happened to see the beheading of seemingly unimportant William Skirmish, the first in a string of bizarre murders across London. Soon Peter finds himself managing magic feuds while trying to uncover a killer able who definitely falls outside of normal investigating capabilities. Midnight Riot (aka Rivers of London) is excellent and original! Packed with fascinating history and some different characters than the usual UF fare, Aaronovitch's first is sure to be a hit amongst anyone who loves a good paranormal read. Plus, it comes with blurbs from Charlaine Harris, Diana Gabaldon, Caitlin Kittredge, and Mario Acevedo, so you don't have to take just my word for it when I say give this one a shot! Book two, Moon Over SoHo is out now and book three, Whispers Underground, is due out later this year. I told you guys I would finish this one last week and then I neglected to post. Honestly, I caught up with this series in three days -- it literally took me one day for each book (and it was the weekend, so I got weekend stuff done as well). But, as for the delay in posting, I was actually out of town last week for work. I managed to get some pre posting done before I left, but time sort of whizzed by and I didn't get past saving a draft of this one. Sorry about that. As I mentioned in the Evil at Heart post, The Night Season is a bit different from the rest of the series. Cain expands the series beyond the scope of Gretchen Lowell and the after effects of her crimes. Night Season definitely could serve as an intro to the series for new readers and opens the series up to so many possibilities. In the midst of torrential downpours and flood warnings, Susan Ward stumbles upon a story that echoes back to 1948 and the flooding of Vanport. Meanwhile, a killer stalks Portland and one of the PD's own has become the latest victim. As Archie Sheridan races to unmask a killer, his best friend's life hangs in the balance. The Night Season is nowhere near as dark or disturbing as the first three books in the series. The plotting is stellar and the mystery, as I'd expect from Cain, is gripping (to say the least). An excellent addition, in my humble book junkie opinion! Thanks to everyone who entered. I do have more giveaways coming soon! So Saturday I moved on to book three in Chelsea Cain's Gretchen Lowell series, Evil at Heart. Holy moly! This is a seriously intense series and I just couldn't help but continue once I got started! This third in the series takes place just two months after the events of Sweetheart. Gretchen Lowell, the famed Beauty Killer, is still on the run and Det. Archie Sheridan is in the psych ward recovering from an overdose and pain med addiction. The Beauty Killer task force has been brought back to track down Lowell, Portland's biggest celebrity criminal. But when a discovery at a truck stop is brought to their attention, they request Archie's help. Seems the crime scene is right up Lowell's alley and could mark her return. Violent, gory, and shocking! If you're sensitive to these things, this is probably not the series for you. But, if you're looking for the kind of book that is guaranteed to keep you up all night, you might want to consider giving Cain a try. She's been compared to Thomas Harris and his Hannibal Lecter series. Fortunately, as I mentioned in my review of Cain's debut, she's not made us wait as long to get our fix on her series! I'm seriously invested in these characters and their lives now. I want to know what Cain has in store for them next! Book four, The Night Season, is officially due out this week. It's a bit of a change of pace for the series. Lowell takes a backseat and readers unfamiliar with the series can pick up and start with this new one, which is (I'm reading it now) much less violent so far. In an interesting note, Cain commented on Lowell's popularity as a character and the fact that readers (including me) refer to the books as the Gretchen Lowell series. Frankly, I'm just not sure what else to call them. Book four makes that a bit of a misnomer for sure! I'll update you tomorrow The Night Season (because I'll certainly have finished it by then).